Using a free gift certificate template is a great way to boost sales. In this article, we provide you with 5 templates and 5 alternative ways to boost your sales via existing customers. 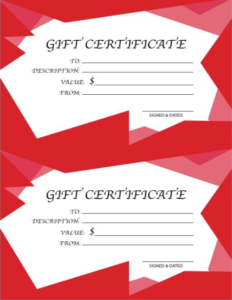 Then print on letterhead paper and cut into two gift certificates using a paper cutter if you have one. If not, a large pair of scissors will do just fine. Finally, fill in the blank fields with your information and they are good to go. Choose the color you want to use and open one of the free gift certificate templates. Save the PDF file to your computer “Desktop” and reopen the image for printing. Print your free gift certificate on letterhead paper. For best results set print scale to 100% portrait mode with at least 300 dpi resolution or more and print in color. If you want a smaller size adjust printing scale accordingly, some testing may be required for best results. To the right of where it says “To” handwrite the name of the person or organization for which the gift certificate is intended for. To the right of where it says “Description” handwrite a description of what the Free Gift Certificate allows the recipient to purchase. To the right of where it says “Value” handwrite the amount that the certificate is worth. To the right of where it says “From” handwrite the name of the person the gift certificate is intended for. Alternatively, you can also display your business name in this field if you wish. To the right of where it says “Signed & Dated” This is where you sign and date the gift certificate. You may also want to print your name. You gift certificates are ready to use. Free gift cards that you can print off are great, but these days there are many other potentially more powerful ways to boost your sales via existing customers who walk into your shop or restaurant. If you use a point of sale system like Square, you can implement a cost-effective electronic gifting program that can boost retail sales by up to 25%. Square’s gift card program enables you to sell your gift cards online and sell plastic gift cards at the checkout point in your store. This will allow your existing customers to gift from wherever they may be to introduce your business to their friends and family. Electronic gift cards, like Square’s, have the added benefit of providing you with smart tracking, which provides valuable sales insights into who recommends whom and who much they go on to spend. 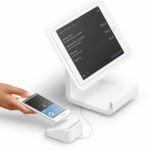 Read this article about Square to learn more about their POS system and the electronic gift card add-on. Word-of-mouth referral is the most powerful way to be introduced to new customer prospects. Customer’s sourced via referral tend to be converted quickly into paying customers, are less price sensitive and are also likely to become loyal customers who refer too if you treat them right. I recommend adopting a simple referral strategy that you can build into your business processes so that you can systematically manage referrals and generate many more new customer introductions as a result. This article will show you How to Get Referrals in 5 simple steps. Every time you make a sale in your store is potentially an opportunity to up-sell another related product or service. If you are a customer of Amazon then you will understand how this works. Amazon monitor what you purchase and use this information to recommend other purchases to you that you may be interested in considering given what you have purchased. Step 1: Identify the 10 highest selling products in your store. You will find the answer to this question in your accounting system or in your POS reports. Step 2: Identify the most likely related purchase that a customer could make. For instance, if you run a convenience store and your customer buys fresh soup, maybe you should be suggesting fresh bread to go with that? Step 3: Train your staff to offer a related purchase for each of your top-sellers. Step 4: Keep a record of how many related purchases are made by your checkout staff as a result of putting this new system in place. Step 5: Review your results after a few weeks and refine and extend your cross-selling initiative as a result of what you learn. Your store is an idle asset outside of your usual trading hours that you pay for. Why not identify a value-add event that allows you to connect with your customers outside of your usual trading hours to promote your business and the use of your products at the same time. For instance, if you run a deli, you could schedule free cookery and tasting sessions once a month. Invite your customers to bring their friends, which will help to introduce you to more customers like them. If you use a free POS system like Square, you have access to many useful reports. For instance, you can identify customers who have not been in your shop for more than, say, four weeks and reach out to them with a promotion to coax them back in. Free gift certificates are a great way to boost your sales. While paper-printed gift certificates are a quick solution, it’s also pretty easy to offer digital gift cards these days thanks to POS systems like Square. Among many other benefits, Square makes it easy to design and sell custom-branded gift cards. Learn more about Square’s POS features, or visit their website.